I look a little greedy as I actually have two makeup bags. 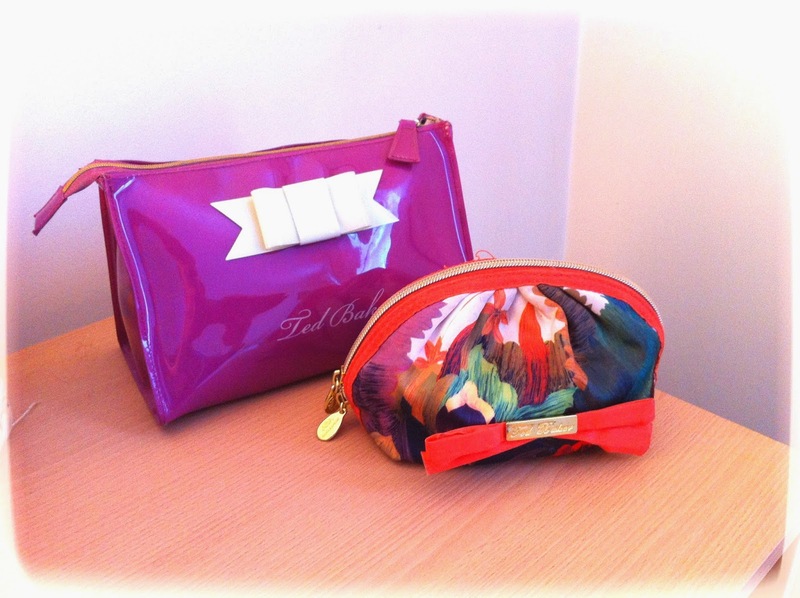 My makeup bags are both from Ted Baker and I received them as Christmas presents (my family knows me so well!). The big purple makeup bag contains most of my makeup, including a good variety of eyeshadows, foundations and mascaras. The small multi-coloured one is my day-to-day makeup bag that travels everywhere with me. 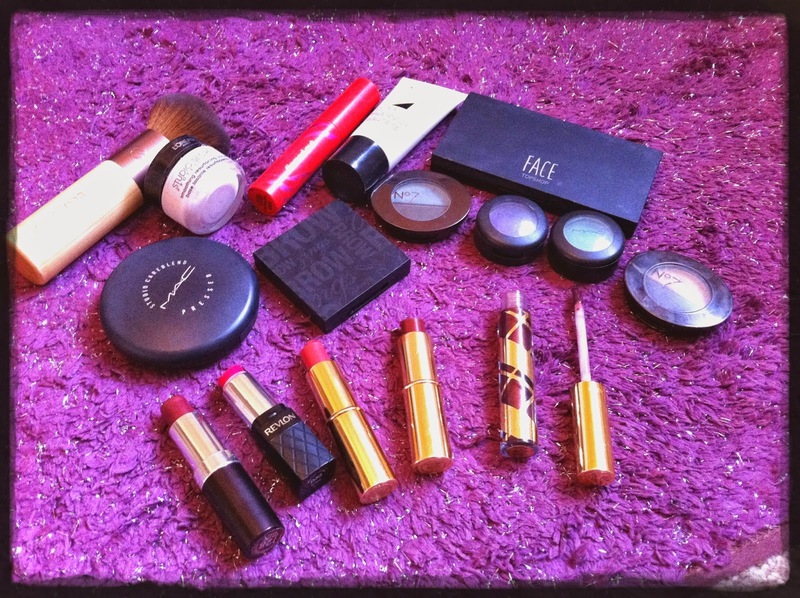 It contains all of my favourite items that I use throughout the day to touch up my makeup. There isn't much in the way of subtle when it comes to my everyday favourites. I like bold makeup looks and I mostly sport big, bold red lips and bright, colourful eyes. My absolute holy grail item in my makeup bag at the moment is Vichy Dermablend 15 Hour Foundation. I suffer with scarring from when I used to pick my spots as a teen, therefore, I need my foundation to provide a good high coverage that is long-lasting. This foundation is the first product I have found to do all of those things and more. If it wasn't in my makeup bag, I'd be completely lost. I use MAC Careblend Pressed Powder to seal my foundation. This powder is pretty good at controlling my oily t-zone midway through the day! I'm a big lover of colours, therefore, I have quite a selection of eyeshadows. The mood I am in first thing in the morning will determine what colour I use on the day. I have to say that I find No7 eyeshadows to be amazing and the pigment lasts pretty much all day. As well as being a fan of eyeshadows, I also love blusher. I've always found that MAC Blush Powders suit my combination skin type to a tee. I have MAC Mineral Blush in the shade "Dollymix" and it sits so well on my cheeks without looking too cakey or patchy. The shade adds a pink tone to my cheeks without looking too flushed (not a good look!). In terms of mascara, I am currently using CoverGirl Flamed Out Mascara which I purchased whilst visiting Canada last year. I love the brand and it's so affordable. This mascara is just coming to the end of its life... boo! I always think that no matter what look you are trying to achieve, it's really not complete without a bit of lippy. I have a ridiculous collection of lipsticks that I've accumulated over time. I have a few shades in my makeup bag including reds, browns and pinks, ranging from Revlon to Estee Lauder. However, I have to say that I haven't found any lipstick as great as Maybelline in the colour Hot Red. It's a gorgeous colour that lasts for hours and hours on my lips. I hope that you have had fun rummaging through my makeup bag with me. Thanks Amy for taking part! For more from Amy, visit www.amy-loves.co.uk or follow @Amys_Loves on Twitter. Thank you sososososo much for posting this!! You're a big inspiration to me and I hope you continue doing what you're doing!